Why did I read this book: I really, really loved Incarceron and Saphique, Catherine Fisher’s science fiction-fantasy YA dulogy that was re-released by Penguin last year. As such, I was understandably thrilled when I saw that Dial was going to re-release another series of hers. As I’ve said before, I’m a big fan of Catherine Fisher’s, so I was extremely excited to delve into this rerelease of her older work.1 And, as someone that has read Incarceron and Sapphique, it’s kind of cool to see some of the same shaping elements are present in this earlier series as in her later work. As with the aforementioned duology, The Dark City‘s realm of Anara is a reverse-society in which technology has existed but degraded and is seen as magic – to the point of religious fanaticism – to its inhabitants. On the part of Galen and Raffi and their fellow followers of the old Order, the so-called “Makers” have become the stuff of legend and lore, with verses and scripture to remind them who they are and where they came from. To the distrustful Watchers, like Carys, the Makers may have been real but magic is complete hoopla, and it is up to them to maintain order and peace at any cost. The dichotomy, especially when mixed with a world that has both technological significance (“relics” left behind by the Makers that sound like items akin to a digital watch, a high-powered torch, communications interfaces, etc) and a definite presence of traditional magic and spell casting is irresistible. I loved the intricate balance between antiquated technologies and the usual sword and sorcery types of magic, especially how everything comes together by novel’s end (leaving plenty of tantalizing room for the next three installments). In terms of characters, these too are similar to those cast members from Incarceron and Sapphique – there’s the trusting innocent boy, the cunning girl, the ruthless teacher/priest type figure. With the exception of Raffi, who is just the sort of hero one would expect in this sort of book (naive, trusting, full of power but has yet to unlock his potential), the other characters are more layered and far more interesting. Galen is something of an enigma – do you like him or hate him? Do you even WANT to like him? He’s fanatical, self-absorbed, suicidal, but also wise and powerful. And then of course there’s Carys, the girl watcher with a huge chip on her shoulder and a golden-tongued skill for lying her way into and out of situations – you really don’t know whose side she’s on (I don’t even think she knows), and that’s awesome. The ambiguity is a cool thing, and a great thread to keep running that may span the series. The eagle said, “Let it be me.” But the eagle was too proud. The bee-bird said, “Let it be me.” But the bee-bird was too vain. So Flain chose the crow, and whispered the secrets to it. The book is a lightning quick read and ends on a hell of a cliffhanger, so I totally *get* Dial’s monthly release campaign (if I had to wait a year between these books, I might forget and lose interest because it’s a very fast-paced, addictive sort of story-type). My biggest criticism with The Dark City is that it felt very much like a teaser; an amuse bouche of the senses. There’s no resolution or real meat here as the storyline is fairly straightforward with little in the way of complexity or development. 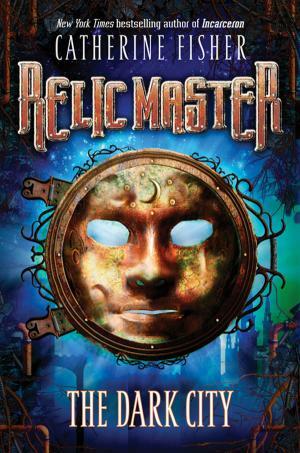 That said, that quick, palate-teasing taste that I’ve had of the Relic Master series with The Dark City is certainly enough to intrigue me and keep me around for more, in hopes of heartier fare to come. I’m very very excited to see where the next book takes Cerys, Raffi, Galen, and company – and the best part is, I already have Book 2 at my fingertips. Recommended, especially for reluctant readers who want to be immersed in a story (and are perhaps short on patience). The world is not dead. The world is alive and breathes. The world is the whim of God, and her journey is forever. The seven moons were all in the sky at once. Tonight they made the formation that Galen called the web: one in the center – Pyra, the small red one – and the others in a circle around her. They glimmered over the treetops; it was a good omen, the sisters’ most perfect dance. Raffi stared up at them with his arms full of wood. As an experiment, he let his third eye open and made tiny purple filaments of light spray from the central moon to all the others, linking them in a flaring pattern. After a while he changed the color to blue, managing to hold it for a few minutes, and even when it faded, a faint echo still lingered. He watched till his arms were tired, then he held the wood more carefully and turned away. That had been better than last time. He was getting quite good at it – he ought to tell Galen. You can read the first 40 pages of The Dark City HERE. And for more, check out the official series website HERE. Book 2, titled The Lost Heiress, will be released on June 14. I was sooo close to getting this at the bookstore, having loved Incarceron. Catherine Fisher is skilled with words! But I decided (foolishly I guess) to wait on it, since I hadn’t yet read a review of it. So, I was thrilled to see yours! I’m really glad the series has already been written. I agree that this one tilts towards middle grade (which isn’t a bad thing). And I too am looking forward to seeing where things go from here! This book was an amazing book. It was the first book of hers that I read and I loved it. It took me less than a day to finish it, and I couldn’t wait to read the others. She is an awesome writer, her books are all amazing.